It is easy to see why hiring a motorhome and spending a few weeks exploring coastal roads and beautiful national parks has become a tradition in the UK. If you are new to driving a motorhome, you may be a bit nervous about navigating the narrow roads in the countryside. If you haven't driven a campervan or motorhome before, it is a good idea to do your research before you pick up your rental vehicle. VroomVroomVroom has put together a few basic driving tips for new drivers. Keep a slower pace, particularly if you are not used to driving a larger vehicle. You will need to take more care when navigating narrow roads and turning corners. Make sure you slow down well before you reach the corner. Speed limits can be different for larger vehicles than for cars. Keep this in mind when you are travelling on motorways throughout the country. If you are visiting any cities and you are nervous about driving on the busy roads, it can be a good idea to leave your motorhome in a designated car park or holiday park on the outskirts of the city. This way you can use public transport to make your way into town without having to worry about where to park your motorhome. Take care to lock your vehicle if you are leaving it, as motorhomes can be targets for thieves. This is particularly true in busy tourist destinations. 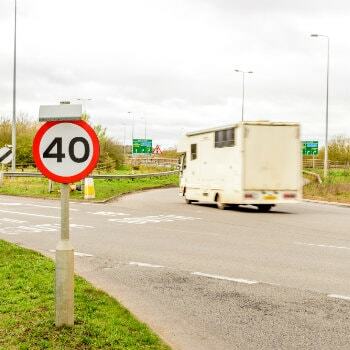 Familiarise yourself with the height of your motorhome in case you come across any low-clearance parking lots or bridges. Check the vehicle before you depart. Make sure everything is properly secured and there are no loose items inside the motorhome. Ensure your mirrors are correctly adjusted before you depart. If you're unsure of where to go with your motorhome, here are a few ideas for some great holiday parks and sights to see. You will find plenty of roads to explore from Cornwall to the Scottish Highlands. Langstone Manor Holiday Park, Dartmoor: Set in the beautiful Dartmoor National Park, this holiday park offers motorhome travellers a mix of camping pitches with hook-ups. The park is close to Tavistock, where you will find some great local pubs. Explore the moors from this great base. Freshwater Beach Holiday Park, Bridport: How does staying on the beautiful Jurassic Coast sound? This popular holiday park has its own private beach, and offers its guests plenty of facilities. If you are a fan of the TV show Broadchurch, you will be in driving distance to many of the iconic filming locations. Travelgan Touring Park, St Ives: If you are planning on a motorhome holiday of England, there is no better region than Cornwall. Located just two miles from St Ives, this park is in an ideal location. It offers facilities such as showers, toilets, a children's playground, a shop selling basic groceries and a regular bus service into St Ives. Glen Nevis Caravan & Camping Park: For stunning scenery a motorhome trip through the Scottish Highlands is perfect. This camping park offers quality facilities to its guest, as well as easy access to the attractions of Glen Coe and Fort William.